Following Saturday’s 2-1 win over Colwyn Bay a few people were asking me about the best ever start to a season and this prompted me to quickly check up on a few more records before this afternoon’s game at Altrincham. As I pointed out in my last article, Chester are not known for winning the first game and the current run of three equals that of the 1978/79 season when Alan Oakes’ side won at Southend and then beat Walsall and Exeter at Sealand Road in the old Division Three. Victory at Moss Lane today would equal the record of 1934/35 when Gateshead, Accrington and Hartlepools (twice) were defeated in Division Three North. The overall club record was seven wins in the Combination at the start of the 1906/07 season. There were also seven wins at the start of the 1914/15 campaign but I have discounted this because Chester later resigned from the league. Chester are now unbeaten in 19 league games with the last defeat on January 21st at home to Hednesford Town. This is now the second longest sequence without a loss but there is a long way to go before the club record is beaten. Between January 1908 and March 1909 Chester went an incredible 31 games unbeaten in the Combination. However the current run has beaten the Chester FC league record. Following the 3-2 home defeat to Radcliffe Borough on December 11th 2010 the Blues didn’t lose again until the 2-1 setback at Lancaster City on March 19th 2011, a run of 16 games. This sequence also passes the 18 game unbeaten run set by Mark Wright’s Conference promotion team which started with a 2-1 win over Shrewsbury in August 2003 and was ended, by Stevenage Borough, at the Deva in December. The 1934/35 team, which finished third in Division Three North, also remained undefeated for 18 games between October 1934 and February 1935. Chester are now unbeaten in 13 away games, a run which stretches back to the 2-1 defeat at Bradford Park Avenue on November 2nd last year. 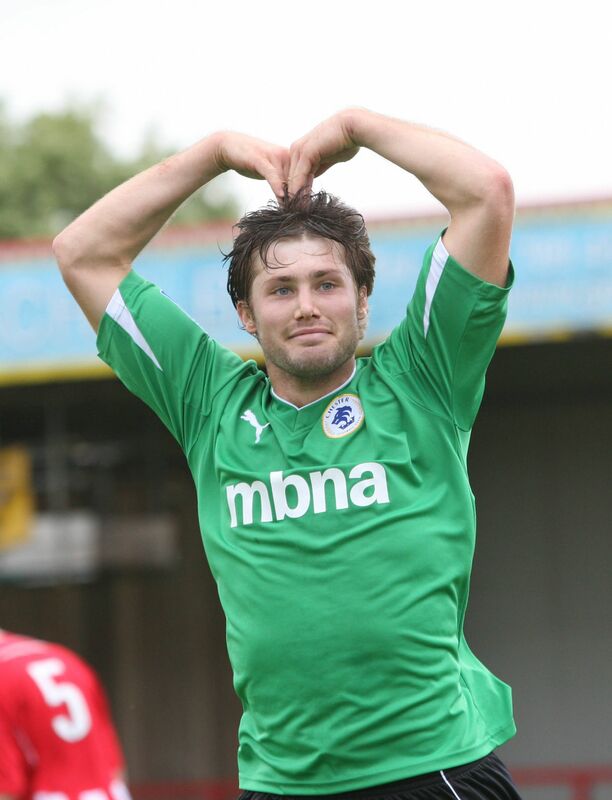 In 2010/11 the Blues went 15 games unbeaten away from the Deva. Starting with the 1-1 draw at Warrington Town in the very first game Chester didn’t lose a league away game until the aforementioned 2-1 setback at Lancaster in March. The club record for away games unbeaten is 17 in the Cheshire County League during the 1930/31 season. The run started with a 3-3 draw at Runcorn in September and was ended by Manchester North End the following April. One record that has been smashed is the record for scoring in consecutive games. Chester have now scored in every league fixture for the last 12 months which is a run of 42 matches. The last time they failed to find the net was at Hednesford in the 1-0 defeat last year. Since the club was re-formed in 2010 they have only failed to score in 2 out of 89 league matches. 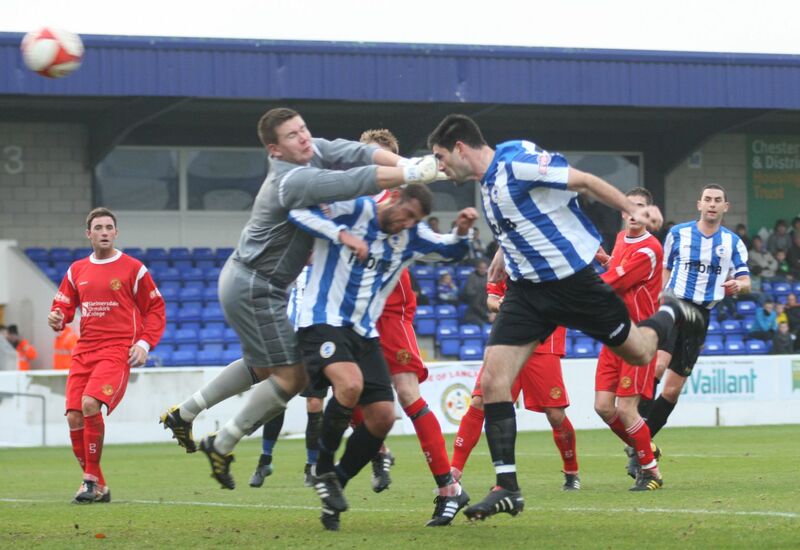 The other game, besides Hednesford, was the goalless draw at home to Witton Albion in March 2011. The previous record was a run of 36 games between September 1930 and April 1931. Prior to this there were also two sequences of 28 games in the early 1900s. In recognition of today’s game I thought I would mention that Chester’s record victory was set against Altrincham when they won 13-2 at Sealand Road in November 1929 and, just to bring everyone down to earth, on Bank Holiday Monday last year Chester lost 4-1 at Nantwich Town.